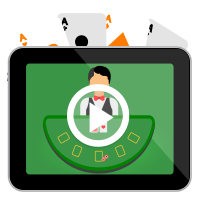 Video poker brings the best of two online casino gaming worlds into one. This being the excitement of playing your poker hand on a user-friendly pokie interface. It’s never been easier to enjoy your favourite video poker game than now. Online video poker brings the entertainment of all kinds of video poker machines straight to your desktop or mobile. This is the easiest way to play your best poker hand possible, without the large glaring crowds of people standing around you. Top-rated video poker games can be found at the online gaming sites we’ve already researched and reviewed for your safety and pleasure. This means you don’t have to scan the internet looking for a video poker app or the biggest payout casinos. We’ve done all the work for you, so all you have to do is pick your favourite video poker game and play. Advanced and beginner poker players can find every kind of video poker variant online at the real world casinos below. Regular players of the original game of poker will know the difference between each kind of poker hand. The best poker hand is a royal flush but now we will explain every kind of hand used in video poker. Royal flush: This hand is the best poker hand you get in the game. It is made up of a Ten, Jack, Queen, King, and an Ace, all from the same suit. Straight flush: This hand is made by having five cards in a consecutive sequence from the same suit. For example, having a hand of 5, 6, 7, 8, and 9 and all are hearts. Four of a kind: With this hand, you must have four of the same value cards from different suits. Full house: This is a hand containing three of the same value cards plus a pair of the same value cards. Flush: For this hand, all you need is for all your cards to be from the same suit, no matter what they are. Straight: Players need five cards in a sequence, from different suits to form this hand. Three of a kind: This hand will include three cards of the same value from different suits. Two pair: You need two sets of paired cards with the same value. Jacks or better: This is the lowest paying hand. All it needs is one pair of the same value cards that are either Jacks or higher. This video poker variation is one of the most played video poker games online. It’s perfect for beginner poker players because it features the jacks or better poker hand. In this video poker variant, video poker players can take advantage of rewarding payouts. This is because you can play between 4 to 100 different hands simultaneously. For extra excitement, try your hand at video poker with an added joker card. This card can substitute for any card to help make any kind of hand needed to win the round. To really spice things up, this video poker variant adds two joker cards. This will help you make the best poker hand possible for major real money wins. This video poker variant will allow you to play with multiple hands at the same time. That way the more hands you win from, the bigger your payout. It also offers one more possible hand to win with. With this video poker variant, you’ll receive a bonus payout for getting a hand with four Aces. Other hands also have higher payouts than normal. If you’re after a massive bonus payout, this is the video poker variant for you. Every winning hand will create the chance to enter bonus rounds for more cash. This is a variation of Jacks or Better, but with a higher payout for a four of a kind that has Aces or face cards. All video poker variants online are completely fair if you’re playing at a safe online casino for real money. We advise players to choose from our list of online sites to play video poker at. These casino sites all have video poker machines that you can play online safely. There is no clear-cut strategy to always win or get the best poker hand, however it is a common rule of thumb to always hold onto pairs as a basic strategy to win. However, if you’re after the best poker hands, you will have to be willing to let go of your pair. Which online video poker variant has the best odds? Jacks or Better is known to have some of the best odds for players who are betting with real money. This video poker variant is known to have an estimated return to player rate of 99.54%.